In chapter 4, Bird tackles the issue of imputed righteousness (hereafter IR). Historically, Protestants have believed that God credits the believing sinner with the righteousness of Christ. Thus, God bestows upon the believer an "alien" (viz. external) righteousness, and Christ's righteousness credited/imputed/reckoned to us constitutes the ground for our justification. This doctrine has served as a significant identity marker for Protestants, since it distinguishes their view of justification from the Catholic view. However, IR has been much maligned of late by several noteworthy scholars. Therefore, Bird goes to the text to determine if and where this doctrine fits in - if anywhere - in the broader field of Christians discourse (pp. 60-61). First, he offers a historical overview of Protestant positions on the doctrine. Interestingly, there has been a diversity of views on IR within the pale of Protestantism. Luther's view wasn't nearly as crystallized as Melanchthon's. Calvin's concept of imputation was closely linked to union with Christ. The Augsburg Confession is altogether different from Luther, Melanchthon, and Calvin, stating that God imputes faith, not righteousness, to the believer. A number of the Puritans (e.g. Baxter) concur with Augsburg regarding the imputation of faith. Yet, despite this diversity, imputed righteousness has been the dominant view among Protestants, serving as a major facet of Protestantism's self-identity. This makes the modern debates about IR all the more significant. Next, Bird discusses contemporary debates over the doctrine. Bob Gundry and Tom Wright have been especially persistent in criticizing IR. Mark Seidfrid has offered a very nuanced critique of IR (though I'd say he comes EXTREMELY close to affirming what IR proponents affirm). In response, IR defenders have offered a number of responses, with John Piper's being the most vigorous. To clarify the debate, Bird offers three helpful points. First, he encourages people to tone down the rhetoric. Second, he notes that justification by faith is not the gospel. The gospel is a story about Jesus' death and resurrection, while justification is the most concrete theological expression of the gospel's meaning and application (69-70). I REALLY wanted Dr. Bird to go into more depth describing the link between justification and the gospel, since this is so crucial. Third (and I think this point is TREMENDOUSLY helpful), imputation is an entirely appropriate way of describing justification within the field of systematic theology. However, from the standpoint of biblical theology, it is more appropriate to speak of justification in terms of incorporated righteousness. Paul rather explicitly states that believers are justified because they are incorporated into the righteousness of Christ. This is how righteousness is apprehended for believers. In the remainder of the chapter, Bird sets out to demonstrate this view. 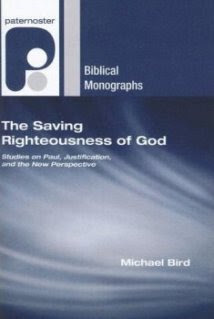 Bird analyzes the traditional IR proof texts; Romans 4:1-25; 5:18-19; 1 Cor 1:30; Phil 3:8-9, and 2 Cor 5:21. He concludes that in none of these texts does Paul say that the mechanism of justification is Christ's righteousness imputed to us. Instead, Paul speaks of our union with Christ as being the basis of our righteousness/justification. The notion of incorporated righteousness arises much more naturally from the text than IR. (I'm running out of time, so you'll have to read the book to see all the arguments Bird offers for his position). Given the supremely christocentric ingredient in Paul's formulation of justificaiton it is far more appropriate to speak of incorporated righteousness for the righteousness that clothes believers is not that which is somehow abstracted from Christ and projected onto them, but is located exclusively in Christ as the glorified incarnation of God's righteousness. I couldn't agree more. Imputed righteousness is often talked about in very odd ways, as if Christ passes his righteousness to us like a gas, so that we can possess it. I don't think this is what Paul teaches. Perhaps it's best to say that God doesn't see Christ's righteousness in us, but that he sees us within the righteousness of Christ. This rightfully places the emphasis back onto Christ, and not ourselves. Moreover, it is important to remember what Bird is not saying. He is not saying that imputation is entirely wrongheaded. Rather, he believes it falls under the purview of systematics. Paul seeks to answer the question, "how are we justified?" His answer is, "through union with Christ." Paul, however, does not answer the question, "how does union with Christ justify?" This is a systematic question, and imputation can help answer this question (p. 87). Bravo Dr. Bird! I think your work on this subject could truly bring resolution to some of the current debates. To conclude, I have (as you might expect) a few questions for you. 1. In Robert Gundry's article, "The Nonimputation of Christ's Righteousness," [in Justification: What's at Stake in the Current Debates? ed. Mark Husbands and Daniel J. Trier (IVP, 2004); 21], he analyzes various examples of the logizomai eis construction, and concludes that in every instance in which it is used, "the counting results in an identification of what is counted with what it is counted as, not in the introduction of something to be distinguished from what is counted..." If he is correct in his assessment, it seems rather unavoidable that faith=righteousness in Romans 4 (e.g in Romans 4:3 - elogisthe auto eis dikaiosyne). How would you respond to Gundry? 2. What do you think of Brian Vickers' dissertation, Jesus' Blood and Righteousness? He makes the argument that imputed righteousness can be demonstrated through a synthesis of the Pauline material. Thus, he appears to think that imputed righteousness is an appropriate biblical-theological category. Have you read this work, and if so, what do you think? Thanks for your clear and concise summary of this chapter. All the better since some in the Reformed tradition have cried for my crucifixion based on this chapter (see further my book "Bird's Eye-View of Paul" for more). 1. I think Gundry's formulation works in some instances (perhaps Romans 4) but in other places it means credit as in impute, not count, or regard as true, so I wouldn't go for a single definition. For me the interesting aspects of logizomai is how it is used in Romans 2 about gentiles being "regarded as circumcized", the parallel between "justify apart from works" and "credit righteousness apart from works" in Rom. 3-4, also how in Romans 4 there is "faith that is reckoned". So the logizomai usage is fairly complex. 2. I think Brian Vickers is certainly on the right track. His synthetical approach is something I would endorse over and against trying to read or find the systematic formulation in each proof text and then accusing those who don't see it there of heresy.